The effigy of a knight in the Comberford Chapel in the north transept of Saint Editha’s Church, Tamworth, is generally presumed to be that of William de Comberford, who was living in Comberford and Tamworth in the first half of the 14th century. William de Comberford, who succeeded as Lord of Comberford, perhaps in the 1330s, was assessed at 2 shillings, 5 pence, on the subsidy roll in 1333. He also held a house, 50 acres of land and 12 acres of meadow in Little Ridware, more commonly known as Pipe Ridware, north of Lichfield and east of Rugeley, in 1337. Some years later, King Edward III granted a royal charter to Tamworth in 1337, with permission for two fairs a year in Tamworth in April and October. On 23 May 1345, a great fire destroyed much of the town centre of Tamworth, including Saint Editha’s parish church. Two years later, in 1347, Baldwin de Witney was appointed Dean of Tamworth, and he began rebuilding the parish church after the fire. A year later, in 1348, the Black Death killed around one-third of the population of Tamworth. Around this time, the chapel of Saint James in Wigginton became known as the Spital Chapel because of its use as an hospital. During the English Civil War, the earlier alabaster monument was badly damaged by Parliamentarian forces after they captured Tamworth in June 1643, and the Comberford chapel was defaced. From 1809 to 1870, this monument was hidden by a great stairs built in the aisle, but the stairs was later removed and became part of the fittings of the Moat House. The monument was visible once again. However, in 1944, the Tamworth historian HC Mitchell, dated the monument in the Comberford Chapel to ca. 1500. According to Mitchell, the figure in the monument was in chain mail and had a collar of SS, a Lancastrian symbol that would support Mitchell’s later dating of the monument. Neither the collar nor the figures representing the children were evident by the early, 1970s during my first visits to Tamworth, nor could I see them in my latest visits in 2007-2011. The monument remains in the Comberford Chapel. 1, John de Comberford, who succeeded to the Comberford estates, and was Lord of Comberford in 1350 and 1366, and died ca 1414. 2, Richard de Comberford, who succeeded his brother. John de Comberford, was Lord of Comberford in 1350 and 1366, and died ca 1414. In 1366, with his wife Alice, John was granted Hopwas and extensive estates between Lichfield and Tamworth by his kinsman, Canon Hugh de Hopwas, a canon of Lichfield Cathedral. 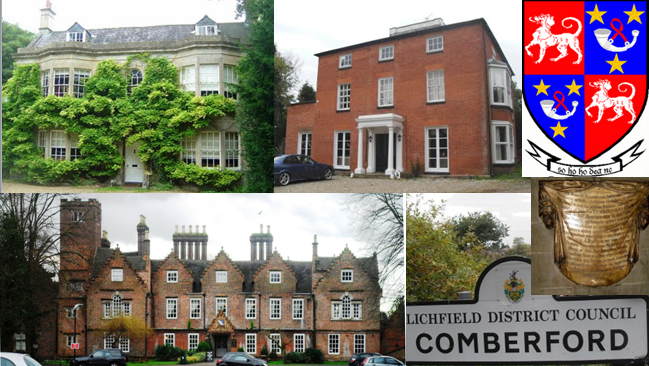 In 1382, John de Comberford returned these extensive estates to the Hopwas family when he granted them to John de Hopwas. In 1387, Richard II gave a charter for the foundation of the Guild of Saint Mary and Saint John the Baptist in Lichfield. Although the lordship and manor of Lichfield were held by the Bishop of Chester and Lichfield, the guild functioned effectively as the local government until its dissolution by Edward VI in 1548. 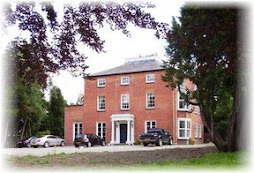 In 1391, John de Comberford owned a messuage and property in Otewellestrete (now Lichfield Street), Tamworth, which may have been the site of the later Moat House. The holding included rights to common pasture on the river side of the Lichfield Road. Although the Collegiate Church of Saint Editha’s lost many of its benefactions, it received a steady trickle of gifts and bequests throughout the 15th and early 16th centuries. Most of these came from local people and, with few exceptions, consisted of small pieces of property in and around Tamworth or of small sums of money. The will of John de Comberford of Tamworth, for example, proved in 1414, included bequests of 3 shillings to the high altar, 1s. 6d. to the Holy Trinity altar, and 6d. to each of the other altars in the church. John also left 10 shillings for masses to the Carmelites of Coventry and 10s to the Franciscan mendicant friary in Lichfield. Palmer (1845), pp 240, 300, 494; James Comerford (1902), p. 2; see Stone, p. 59. James Comerford (1902), p. 2. James Comerford (1902), p. 2; visits by Patrick Comerford to Saint Editha’s, Tamworth, 1970-2011, latest visits 22.3.2007, 28.3.2008, 4.7.2008, 26.2.2011. Visit Warwicks, p. 35; Shaw 1, p. 434. ‘Lichfield: Guilds,’ VCH Staffs, vol 14, Lichfield (1990), pp 131-34; Upton, pp 31, 43. Reg. Henry Chichele (Canterbury and York Society, 1945) 3, p. 321; ‘Colleges: Tamworth, St Editha,’ A History of the County of Stafford: vol 3 (1970), p. 314, http://www.british-history.ac.uk/report.asp?compid=37874 (2.4.2007). (c) Patrick Comerford, 2009, 2013; last revised 5 Jue 2009; 9 January 2013.